Rumors had been circulating in Zimbabwe that an attempted coup was staged in January while President Mnangagwa was abroad on a four-nation official tour. He was quoted by local newspapers on Friday as saying there was no evidence of a rift between him and his vice president, Constantino Chiwenga. "I have known Chiwenga and his colleagues [in the military] since the struggle years. We are comrades and understand each other better than you think," the president said, referring to the struggle for independence from the UK. Analysts say another coup in the southern African country would not be possible within less than two years. 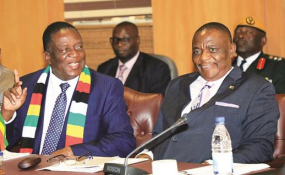 "The said rift between Mnangagwa and Chiwenga has not reached such levels. There is disharmony and discord but the two need each other," political analyst Alexander Rusero told DW. "It is all about political stakes. One has got a command in the military, the other has the support of members of parliament and party functionaries. So they have to balance their power," he said. Chiwenga is said to be in control of the military, while Mnangagwa has a strong civilian following. The last three weeks of January saw many Zimbabweans brutally attacked by security forces. The brutal clampdown came in the aftermath of protests against a dramatic 150-percent increase in fuel prices that triggered price hikes for basic commodities. Lawyers and rights groups say that, despite a promise from the president to crack down on such abuses and investigate the actions of security forces against protesters, hundreds of people remain in detention, with many denied access to legal representation. In the capital, Harare, a vehicle service garage attendant, who wishes to remain anonymous, told DW he now lives in fear. "I feel so insecure. Soldiers are everywhere, they are controlling fuel and bread queues. You find them on public transport on the buses that we are boarding to and from work. It is quite a scare if you recall what they did in the past weeks, beating up people," he said. Residents in Harare and several other cities say scores of people suspected of involvement in the protests were dragged from their homes. Some opposition lawmakers have gone into hiding. Lawyers say 12 people were killed during the unrest, while police put the figure at three. Julius Choto lost his only son, a 22-year-old promising footballer, to violence during the January protests. His son was shot in the head. Choto says the government has lost all feeling for the people. "In Zimbabwe, humanity has lost value. It's the same government that said: 'We are going to do everything.' Whatever they promised, it was all thrown into the dustbin. They are now using bush tactics," Choto said. Politicians and civil society are now calling for dialogue to revive the poisoned political and economic situation in the country. Although the government has acknowledged security forces did commit some violations, it insists the action against protesters was necessary. "If the authority of the state is in question, then the state has an obligation to demonstrate that it exists to ensure law and order," said George Charamba, Mnangagwa's spokesperson. However, opposition leader Nelson Chamisa says the brutal response was unnecessary, even if some protesters did commit crimes. "The role of state security has become an issue in our politics. We now need to know the frontiers of the security sector in the country," Chamisa told reporters. "Politics should be confined to civilians, the military, the police and the intelligence playing their constitutional mandate to defend the will of the people and not to undermine it."